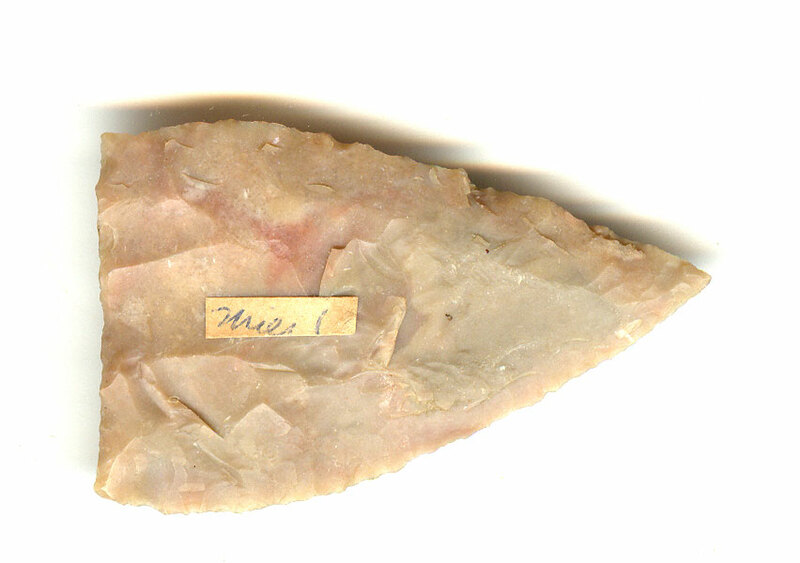 A Medium Size, Thin, Colorful, Visibly Aged And Anciently Used, Well Made, Early Triangular Blade That Exhibits Stone Coloration Aging And Overall Surface Patination, Rolled Blade Hinge Use Wear, Correct Blade Sharpening Use Wear, Aged Surface Deposits, Correct Early Style Flaking, Visible Ancient Use Wear, Correct Material And Manufacture For The Area Found. Ex-Rocky Hall Collection. The Thinness, Fine Blade Edgework, Long Multiple Basal Thinning Strikes And Overall Shape Determines The Type. This Is A Nice Early Example, Displaying Age and Ancient Use, Being In Very Good Condition! Includes A Ken Partain Certificate Of Authenticity.